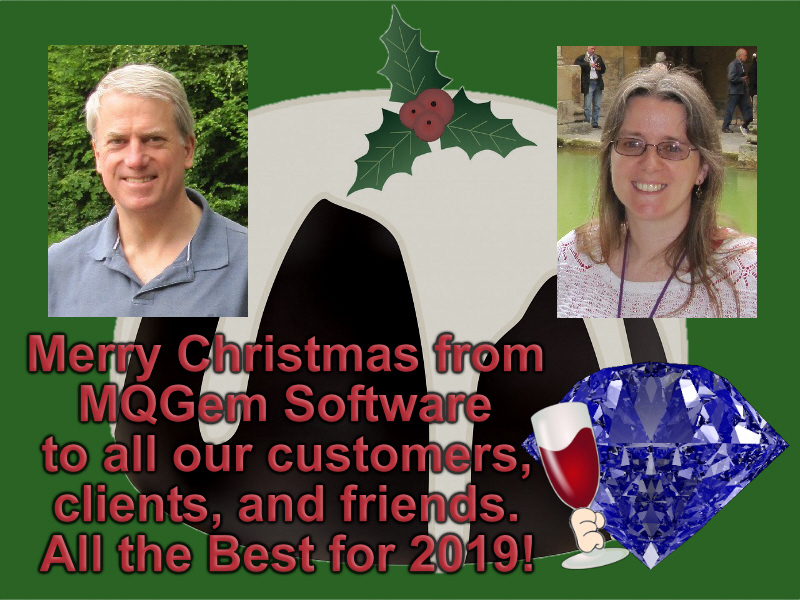 In this post we look back on the year that was 2018 and what happened in both IBM MQ, and MQGem Software. Both IBM MQ and MQGem Software products had a number of new releases in 2018. Three new versions of our premier product, MO71 – a graphical administrative product for IBM MQ. Version 9.0.6 was released in January with various new features including version checking. Version 9.1.0 was released in August providing support for IBM MQ V9.1, and then version 9.1.1 was released in December improving the Alter List dialog, providing proxy support, and support for IBM MQ V9.1.1. MQSCX has had minor updates through the year to provide support for new IBM MQ command levels. A new version of QLOAD – our unload/load IBM MQ queues product, version V9.0.1 was released in December with the capability to load messages from non-QLOAD format files. This feature is also included in MQEdit. MQEdit – our live-parsing IBM MQ message editor – also had two new versions this year. Version V9.0.3 was released in March providing several features which make it easier to manage a group of users using the editor from a central position, and V9.1.0 was released in November with customer requested new features including Character Substitution Mode, Select All and loading messages from non-QLOAD format files. A new product was added to the MQGem Software portfolio this year, by request, we made a fully support version of Q, based on Paul’s MA01 SupportPac. The last Fix Pack on IBM WebSphere MQ V7.5, Fix Pack 7.5.0.9 was released in September. Three new Fix Packs on IBM MQ V8. Fix Pack 8.0.0.9 was released in April. Fix Pack 8.0.0.10 was released in June. Fix Pack 8.0.0.11 was released in December. Three new Fix Packs on IBM MQ V9. Fix Pack 9.0.0.3 was released in March. Fix Pack 9.0.0.4 was released in May. Fix Pack 9.0.0.5 was released in August. 2018 saw the latest major release of IBM MQ, V9.1.0, announced in early July and available at the end of July. There were also two new continuous delivery (CD) releases made available in 2018. V9.0.5 in March, and V9.1.1 in November. Defect support for a CD release is available for 12 months from the availability of the release or while it remains one of the two most recent CD releases, whichever is longer. 2018 was the year that IBM got serious about IBM MQ in Cloud. In January IBM announced its new experimental IBM MQ on IBM Cloud service. Then in February IBM announced its IBM MQ on IBM Cloud service had now moved into Beta. Then in March the IBM MQ on IBM Cloud service, previously in Beta, was now generally available. June saw a new MQ cloud-related announcement as IBM MQ delivers MQ as a cloud service on IBM Cloud and hybrid licensing with IBM MQ Advanced to promote migration to the cloud. In August IBM provided AMS and TLS facilities on the MQ Cloud service. In September IBM announced that MQ is now available as a managed service on AWS. In December IBM provided Managed File Transfer facilities on the MQ Cloud Service. There have been quite a number of events throughout 2018 that have had IBM MQ content delivered at them. A separate post contains all the material that is available on-line from these various events. 2018 has been a great year for all things MQ, including celebrating the 25th Anniversary of the original version of MQSeries. MQGem wishes all its customers, readers, and friends a Happy and Prosperous 2018. HAPPY NEW YEAR!